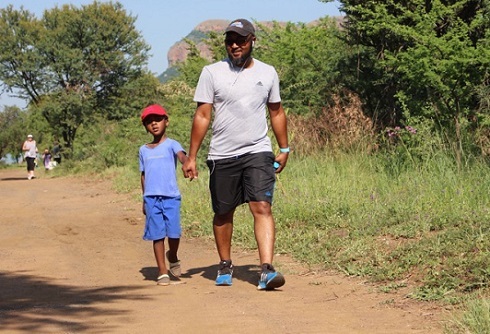 In this edition of the SA parkrun newsletter, we see legends in the running community at two parkrun launches over two weekends and take a closer look at the phenomenon of parkrun tourism. 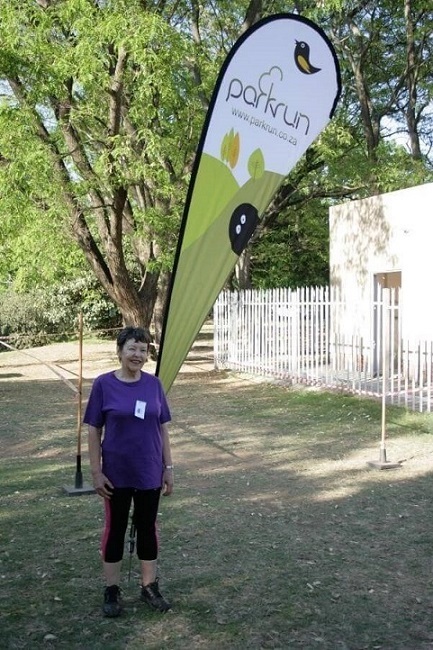 We also have an update from Roodepoort parkrun on improvements to the venue and celebrate our parkrunner of the week; Raylene Peine from Kimberley parkrun. The King Williams Town community has had to wait quite a while to launch their parkrun. In fact, Border and Eastern Province regional director, Bob Norris, told me that it was almost a year to the day that the idea of a King Williams Town parkrun was first mooted. But Saturday 13th February proved to anything but unlucky as Mike Webb and his team sent over 300 eager parkrunners on their way across the King Williams Town golf course. Mike was wearing a splendid fairy costume as he often does at South African races. The course is a testing one but everyone seemed to enjoy it especially the bell ringer who encouraged everyone up the last steep hill to the finish. 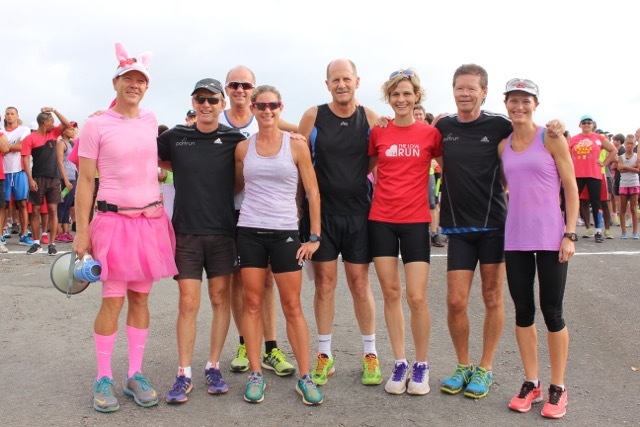 The parkrun was also graced by some current and past Comrades champions and elite athletes who were down in Border territory to run the famous Surfers race in the afternoon. 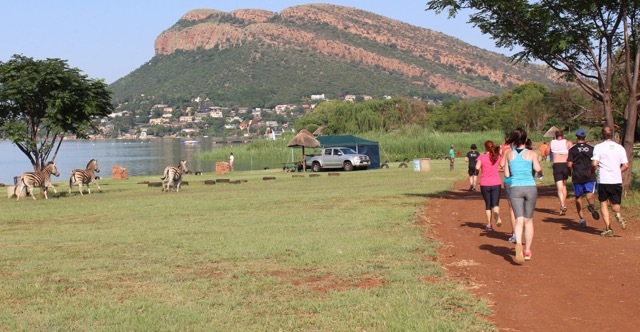 This Saturday it was the turn of Hartbeespoort to start its first parkrun, and a large crowd of eager locals and parkrun tourists gathered at the edge of the dam water on a hot and steamy morning. 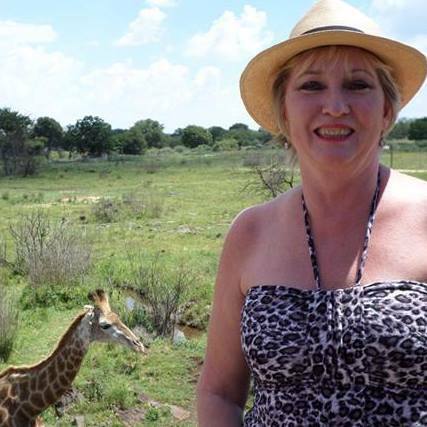 There were even some Zebra, Blesbok and Springbok looking on in bemused fashion as event director Trevor Parry sent the eager runners on their way. The Parry surname is well known for a number of reasons, not least of which is Trevor himself. He has an impressive running C.V. which includes 3 top 10 gold medal finishes in the Comrades in the 1970’s. Now Trevor is giving back to his community in Hartbeespoort by organising a parkrun. True to form his son, Lindsey, was first finisher at this inaugural run and the parkrunners finishing behind him gave the parkrun lots of positive reviews. We have noticed at parkrun that there are two types of parkrunners; those who remain loyal to their home run and very rarely run at another venue, and those who love to travel and experience as many different parkruns as they can. This latter group we call parkrun tourists. The parkrun tourists are a closely knit group who share their own Facebook and WhatsApp group. At the moment it seems that the criteria for joining the official group are first of all a passion for travel and for parkrunning, and secondly to have run at least at 20 different parkrun venues. The potential value of the parkrun tourists to the tourist industry of South Africa has yet to be fully understood. But I have a feeling that in years to come it is going to be significant. Two of the most dedicated (Can I use the word “fanatical”?) tourists are Jabu Mhkize and Margie Jenkins and her daughter Sarah. Jabu has travelled extensively by car and plane over South Africa and has almost run at every South African venue, not once, but twice. When he broke a bone in his foot a few months ago he simply learnt to run with crutches and was able to finish a parkrun in 55 minutes with a plaster cast and two crutches. 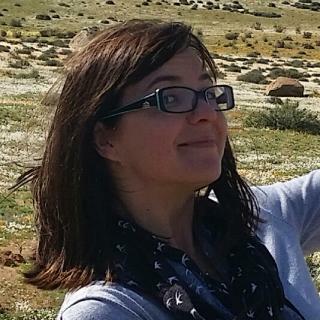 Margie Jenkins has logged more driving kilometres than a full time taxi as she and Sarah have traversed South Africa travelling to as many venues as possible. Originally a Dusi, Pietermaritzburg parkrunner Margie and Sarah do run at Dusi from time to time but only long enough to draw breath before driving hundreds of kilometres to their next unexplored venue. I am often asked if walkers are welcome at parkrun. My reply is that “parkrun” could well be called “parkwalk” as well. Of course walkers are welcome at our parkruns and our volunteers wait for everyone. A year ago I was badly injured and walked a couple of parkruns. I found it very rewarding chatting to the backmarkers and teasing the faster runners as they lapped us. The only thing we ask of our walkers is that they start at the back of the field and make way for faster runners on multiple lap courses. So please spread the word: parkrun welcomes walkers at all times. February 13th saw MRPSport at Rietvlei, Umhlanga and Belville parkruns. February 20th saw MRPSport feature at Ballito and Durbanville parkruns. We painted these parkruns red with our visor giveaways, which were welcomed by all the runners who received them. This Saturday MRPSport will be at Ebotse, Thousand Hills and PE Hobie Beach parkruns. Look out for our Maxed and peak giveaways! A few parkrunners have enquired about our Maxed footwear range. We are working on bringing you the range at different events, in the interim, all our footwear is available online and in-store. There are exciting things on the horizon for parkrunners so please stay tuned for the special giveaways and promotions that we have planned for you. We will ensure that you are kept informed through the parkrun newsletter. Another friendly reminder to all parkrunners that the achievement t shirts will be available from the end of May, so please be patient. We will do our very best to get to the backlog and deliver the shirts as soon as possible. The shirts will be delivered to your nearest store for collection. Further details will follow for our new ordering process. Visit www.mrpsport.com for your latest fitness and outdoor gear. Looking for ideas for fun, creative outdoor play? Grab some balls, a hosepipe and have some fun in the garden with your kids. It’s enjoyable and great exercise for the whole family! Find out more here. Discovery Vitality and Disney, one of the most loved brands in the world, are making living a healthy lifestyle fun for you and your family. Visit the Disney Healthy Living website where you and your children can learn and play together at the same time, with a wide range of health-orientated interactive games, healthy recipes and other activities to make healthy living even more enjoyable for the whole family. A year ago I started as a volunteer at Lonehill parkrun with trepidation, and worried I had taken on more than I could cope with. Today I know I have enriched my life in a community activity that I love. We have a core volunteer group of dedicated people that give up their free time to make this a happening weekly event. These volunteers are my friends and people I would not have had the pleasure of engaging with had I not taken the first step. I never thought I would enjoy the weekly preparation for a community event that has attracted over 900 runners for the last three weeks. The added benefit is working with the awesome parkrun family, Cara Fordyce and Gill Fordyce. Roodepoort parkrun is the second oldest parkrun in South Africa and during its fledgling years has grown from strength to strength. On a very soggy morning just over three years ago, we had 6 drenched runners finishing the course ankle deep in water. Just over a month ago we broke all records with 843 completing the two lap circuit. The event has become a community show piece! In a recent Our Neighbourhood Florida bulletin that goes out to thousands of members in the greater Florida area, the editor thought he was in the middle of a state funeral procession due to the traffic build up that stretched back over a kilometre a few Saturday mornings ago. Suggestions were made (tongue in cheek) that we apply for a robot at the entrance of the park. During the early days we inherited a run-down park that had a derelict lapa that was inhabited by vagrants. The grass was seldom cut and there was an abundance of litter evident all over the park. With the assistance of George Taylor and the parkrun Raiders, we put our collective skills to use. Mike Watts, our resident builder, as well as George Karas, our plumber, got stuck in. They started revamping the lapa and with the assistance of our local Councillor managed to install proper ablutions with running water. The lapa was secured with security fencing and shutters were installed to complete the safety requirements. 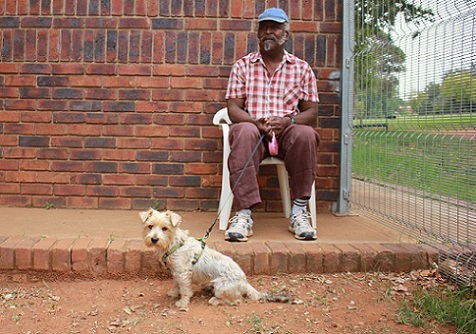 George Taylor is in constant contact with the local municipality to ensure that the grass is cut regularly. James has taken up residency in a part of the lapa and ensures that the area is kept clean and tidy. Recently James acquired an unusual acquaintance namely Cheeky the poodle. Some unscrupulous individual pulled up in his car one afternoon and pushed Cheeky out and drove off. James has adopted Cheeky who lives in the lap of luxury with beds, baskets and blankets and dog food all donated by the parkrunners. In order to sustain the area, numerous saplings have been planted around the route too. Roodepoort parkrun has some of the most picturesque settings, particularly in spring and autumn. Go to our Facebook page and have a look, truly breath taking! How has parkrun changed your running: I never used to enjoy running, and would only participate in fun events. Since joining parkrun, I now run more regularly, and I am more motivated to run. Most memorable or funniest parkrun moment: There is one gentleman who, when parkrun started, only walked 1km, and slowly improved, until one Saturday he managed to complete the whole 5km! The response he received from the volunteers was amazing, and kept him motivated to come back. What I like about volunteering at parkrun:: The atmosphere at parkrun is invigorating, and by volunteering, I get to be a part of it. Why others should volunteer at parkrun: You get to meet people, and get fit, all in a fun, supportive environment. What fellow volunteers say about her: Raylene is such a positive, cheerful person – always willing to help and always willing to go more than the extra mile. What a privilege to have her on our team! 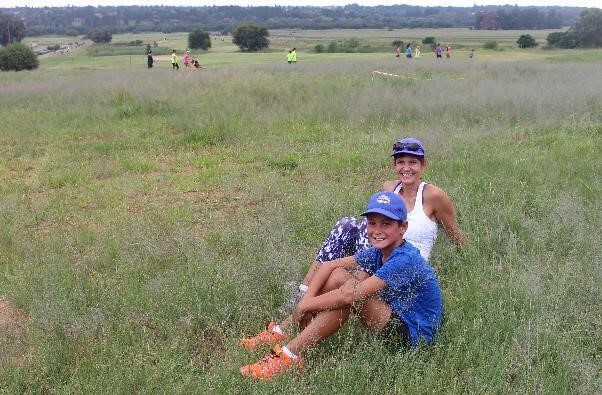 In this edition of the SA parkrun newsletter, we take a look at how many people are taking part at parkruns across the country, we see how Mr Price Sport introduced themselves to the parkrun community and celebrate our parkrunner of the week; Jenny Page from Delta parkrun. 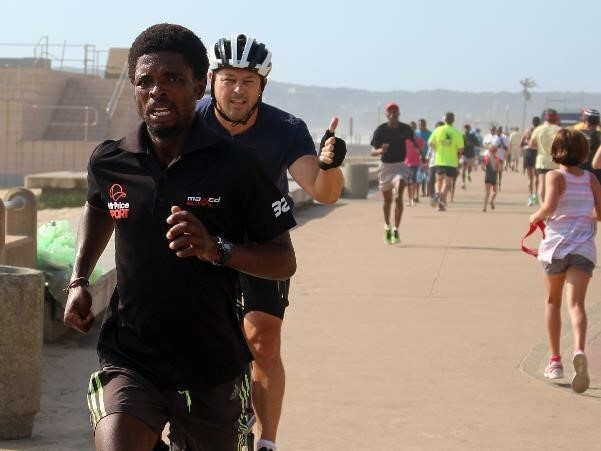 Our newest parkrun sponsor was welcomed to the parkrun family on Saturday 30th January at Durban’s North Beach parkrun. Simultaneously we announced our new sponsor at several other parkruns around South Africa (See Chantal Donnelly’s write up below). 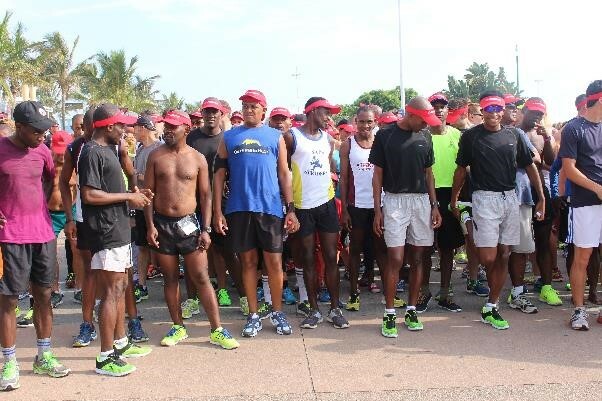 Over 1,600 parkrunners set off to run the parkrun route alongside the Indian Ocean and it was a truly inspiring site to see hundreds of bright red Mr Price Sport peak caps streaming off down the esplanade. Congratulations to Chantal Donnelly and her team from Mr Price Sport and to Stefan and Jenna van der Merwe and the dozens of North Beach volunteers who worked hard to ensure everything went smoothly. We are looking forward to a long and happy relationship with the exciting team at Mr Price Sport. Because Mr Price Sport is our apparel sponsor they will also be manufacturing the new milestone shirts. We ask for your patience as they await the arrival of the first batches. I promise the wait will be worth it. 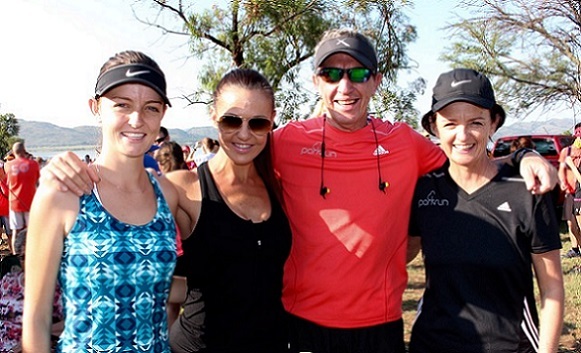 parkrun continues to grow very rapidly in South Africa. We are still welcoming about 5,000 new registrations each week, with 25,672 participants last Saturday in South Africa. 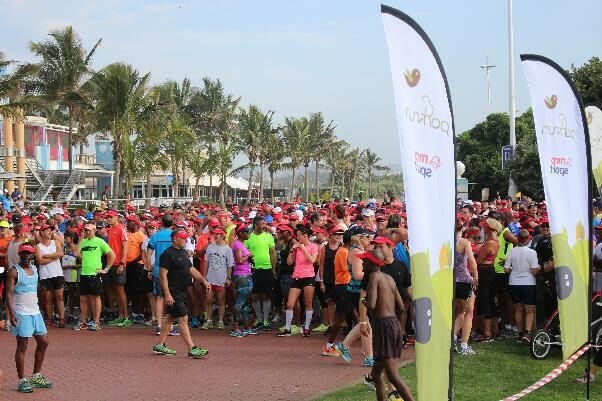 Last month 106,281 people ran at parkruns around South Africa. More importantly 3,016 people volunteered at these parkruns. 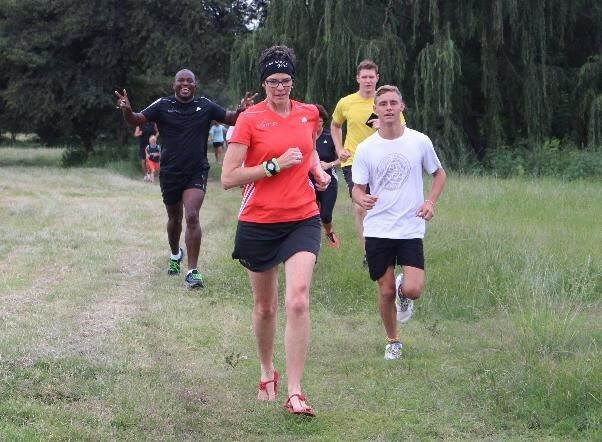 Last Saturday the Heron Banks parkrun was launched on a lovely one lap loop course which includes a long stretch along the banks of the Vaal River. Over 300 eager parkrunners listened to event director, Frikkie Jansen van Rensburg welcome them to the Vanderbijlpark parkrun before setting off on a glorious late summer’s morning. Frikkie’s parkrun is going to be a popular one in future as the 300+ participants arrived despite there being a major road race nearby. Some parkrunners first ran the Sasolburg 10km and then ran the parkrun. This Saturday we will launch the King Williams Town parkrun in the Eastern Cape. Mike Webb and his team have been very patient and have waited many months for their special Saturday birthday. We have also been champing at the bit to watch another Border community enjoy its own parkrun. It will be a busy February for new parkruns, as these two launches will be followed by new parkruns at Hartbeespoort (20th) and Thousand Hills (KZN Botha’s Hill) (27th). 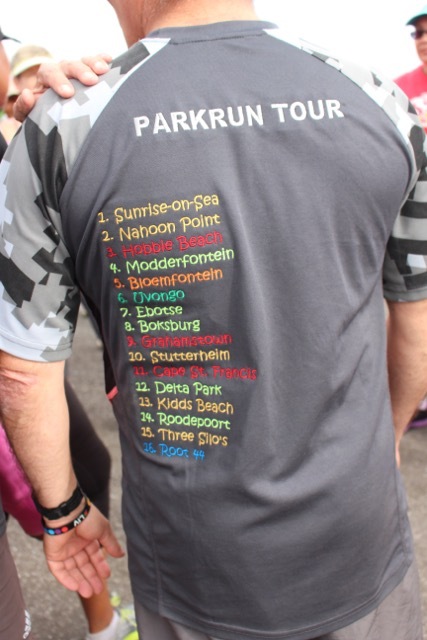 Last week MRPSport officially announced and launched their apparel sponsorship of parkrun South Africa at North Beach parkrun, Durban and they also featured at Greenpoint, Root 44, Delta and Modderfontein parkruns. It was an astounding, record-breaking success. MRPSport will activate at 3 parkruns this weekend, namely: Rietvlei, Umhlanga and Bellville. Look out for their Maxed giveaways and enjoy a bit of shade and refreshment, compliments of MRPSport. A friendly reminder that the achievement club tee shirts will be available from the end of May, so please be patient, we will do our best to get through the backlog and delivery of your shirts. MRPSport is also assisting with delivering your achievement shirts to a store near you for collection. Further details to follow for our new ordering process soon. Visit www.mrpsport.com for your latest fitness and outdoor gear. To date, Vitality Active Rewards is our fastest-growing benefit and this engagement has exceeded our expectations: Vitality Active Rewards members are exercising 25% more and have earned hundreds of thousands of smoothie and coffee rewards. This record level of engagement has led to an unprecedented spike in call centre queries and for this reason, many of you are not receiving the high service levels you are accustomed to from us. This is unacceptable in our view, and we are doing our utmost to rectify the situation as soon as possible. Please note that even if your Vitality fitness points aren’t reflecting, we will retrospectively award points and ensure that your weekly Vitality Active Rewards are not affected. We have set up a Vitality support page on our website for all queries related to fitness devices, apps and achieving Vitality fitness points. You can also view your Vitality status and see how many Vitality points you have and access our Vitality Active Rewards FAQs online. If you’re not already enjoying a FREE weekly coffee or smoothie, you should be! Activate Vitality Active Rewards to get active and get rewarded. 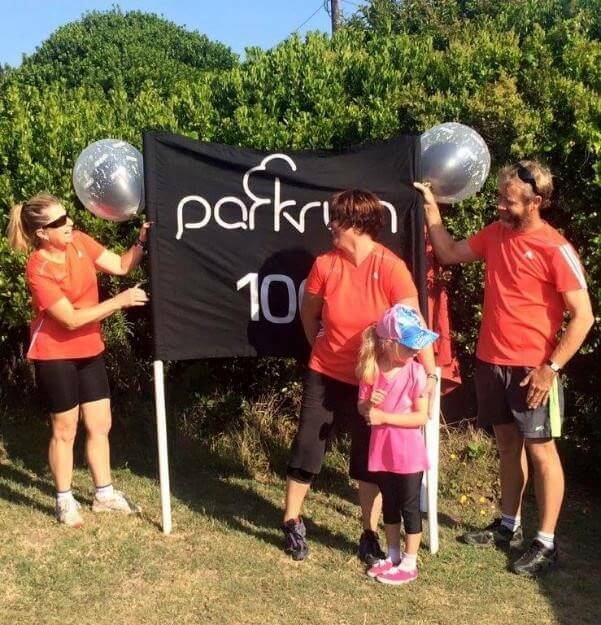 On Saturday, December 5th, 2015, the Hartenbos District of the Western Cape gave birth to a healthy new, 5km parkrun venue. Our Event Director, Werner Morkel-Brink, together with the invaluable assistance of Barend Jordaan, cannot be praised too highly for their tireless efforts in, firstly, finding a suitable venue and, secondly, organising and working with the small, but enthusiastic, band of volunteers preparing the course for the opening. It was not only the route which had to be created from just about nothing but also the administration. Risk assessments, website and Facebook page changes, marketing initiatives, and finding sponsors for equipment and materials required for the new route. It all had to be attended to - it was, indeed, a hectic few weeks! The opening was a huge success and it is believed that the number of runners will continue to grow and the venue itself will continue to develop and cater for the runners' needs and desires. 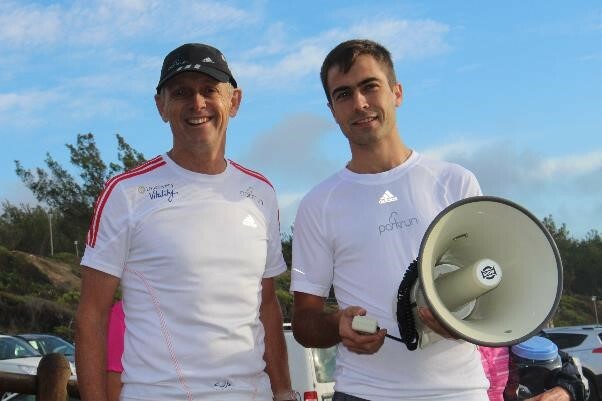 We, as a Hartenbos parkrun family, rightly feel proud of what has been achieved but it would not have been achieved without the enthusiastic and able leadership of Werner and Barend. My husband decided we should join a parkrun in East London (Nahoon Point parkrun). I was not happy as I am not a runner, and was not even a walker at that stage. I went along and completed it as red as a tomato and was stiff the next day. I loved it and have never looked back. I am currently completing parkruns at Kidds Beach, hoping for Nahoon Point to open again. My husband’s confidence in me and support is something I can’t explain. He keeps me motivated and keeps me going as well as the special friends I have made and shared laughter and tears with. I can’t imagine getting up on a Saturday and not running parkrun. I was 20kg heavier at the time, now I am healthier and loving the running. I do all the events I can. Thank you for your newsletter and for parkrun. It changed my life, our 5-year-old daughter Emily is also now doing parkrun and loving it, so it’s family time as well. I completed my 100th parkrun on 30th January. How has parkrun changed your running: It has helped me improve my fitness tremendously. I have changed my eating habits and the weekly event ensures that I cannot slacken with my fitness regimen. I enjoy that it is international and that I have friends that do Delta and other parkruns, and we have this in common. I like seeing where I am each week relative to others in my age group, locally and internationally. A number of my students do Delta parkrun and this group is growing. It gives us something in common and allows us to see each other in a different light. Most memorable or funniest parkrun moment: On one of my very first parkruns, I was totally focused on not tripping over dogs or children, when I heard a desperate plea coming from some distance behind me ‘noooooo, stopppp, noooo, stopppp’ getting rapidly closer and closer. Finally I realised what was happening; the biggest dog I have ever seen was hurtling down the hill with a proportionally small man attached to the end of her leash, trying to rein her in. He disappeared into the distance still yelling ‘noooooo, stopppp, noooo, stopppp’ and I have never seen either of them at parkrun since. Favourite volunteer role: My walking partner and I do parking duty each week which does allow us to leave early. What do you like about volunteering at parkrun? parkrun could not happen without the volunteers, and I like giving back. The volunteers are like a family and it is great to not just be another barcode but to be part of that family. I also appreciate that if I do parking duty I can get away early. Why should others volunteer at parkrun? We rely on volunteers for parkrun to take place, so we really need people to come forward. What fellow volunteers say about them: Jenny is fundamental to Delta parkrun and we value her input enormously. Having parking marshals is a condition of using the park, so her role is pivotal to running our event. She handles the sometimes colourful language of participants who are running late with great grace and aplomb.